Davies’ Locker can store up to 500 treasure maps and/or SOS bottles! Players will receive a gift bag on login during the month of December. This only applies to paying subscriber accounts and characters that are 30 days old or older. And rarely, an “infested tree”. What is it infested with??? Has a maximum of 10 charges. Regains 1 charge per day during November. Double-click to obtain food from it. Turducken Platter – contains eight servings of various food items, including Roast Turkey, Roast Duck, Roast Chicken, Turkey Legs, Giblet Gravy, and plates of food. Place three bets. The dealer rolls dice to make a five-die “poker” hand. During the course of the game, you may pull back up to two of the bets. See the casino dealer for payout information and complete rules of the game. Those loyal still to Minax and Mondain’s creation work fervently to rebuild the mechanical demon, in hopes of once again summoning Exodus into Britannia. Visit the NPC Exodus Arch Zealot outside of what used to be Ver Lor Reg in Ilshenar to learn about how to gain the Keys to the encounter and how to perform the Summoning ritual. Keys may be collected via three paths, the Warrior, the Rogue, and the Craftsman. In order to perform the Ritual you must party up with those you wish to play the encounter with. You do not need to party to acquire the keys. Everyone in the party must have their own set of Keys to perform the ritual. You may perform the ritual at any shrine in Trammel or Felucca, except the Chaos shrine.Exodus may be summoned so long as Exodus has not been killed in the last ten minutes. Due to the restricted architecture of the Spirituality Shrine, a “satellite” shrine has been constructed in front of the original, use that Shrine to perform the ritual. If at any time during the Encounter Exodus’ HP drops below 60%, additional groups will not be able to join the encounter, if Exodus’ HP regen to 75%, additional groups will be able to join the encounter. Players will be teleported to a random Ilshenar shrine if they opt to not leave the area within 10 minutes of Exodus’ death. There is a two minute warning message before this happens. Tinkering Bonus Talisman will no show the correct success rate. Raised garden beds and plants inside the bed will be deleted when a IDOC house falls after the next server maintenance. 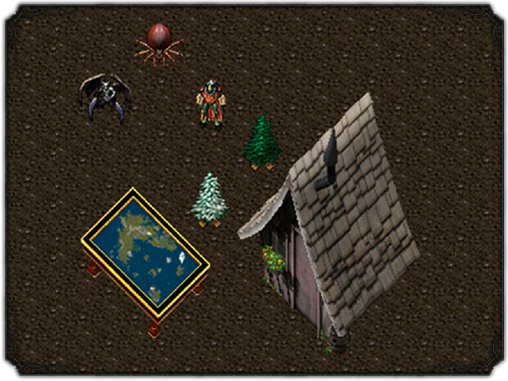 Players can dye display cases after it has been returned to deed form and replaced. x (int) The x coordinate of the target location. y (int) The y coordinate of the target location. z (int) The z coordinate of the target location. x(int) The x coordinate of the target location. y(int) The y coordinate of the target location. Z(int) The z coordinate of the target location. type(number) The terrain type id of the tile at the given location.